"On Christ, the solid rock I stand!" 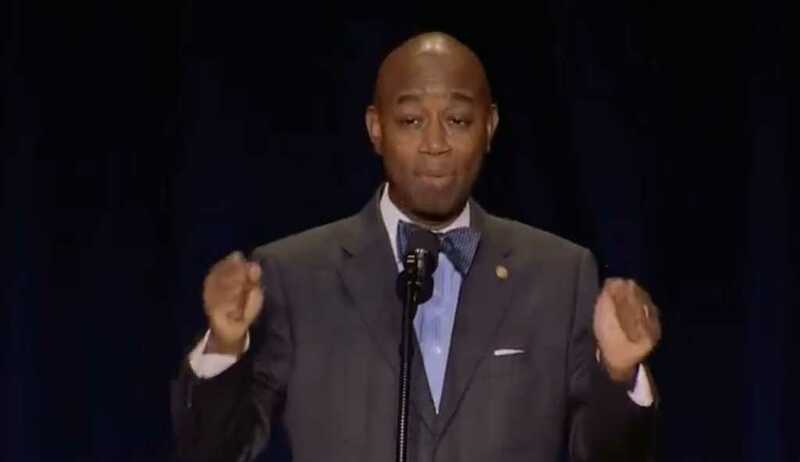 U.S. Senate chaplain Barry Black brought down the house at the National Prayer Breakfast in Washington, D.C., on Thursday morning, sparking cheers and inspiring thousands of audience members to jump to their feet. Black’s riveting keynote address began with him telling the thousands of people in attendance that, despite such public division, Republicans and Democrats in Congress actually get together each week for both a prayer breakfast and a Bible study. Additionally, the chaplain said he even knows some senators who are ordained ministers, and praised the faith of a great many in government, adding that the chiefs of staff, among others, also get together and do a Bible study each week. Toward the end of the keynote, Black encouraged believers to fervently pray for everyone in their lives and to pray with intimacy, before delivering some energetic lines that brought the audience to their feet.